I often contemplate the purpose and format of videogame reviews; what should be conveyed, what is the most effective means of conveying it. 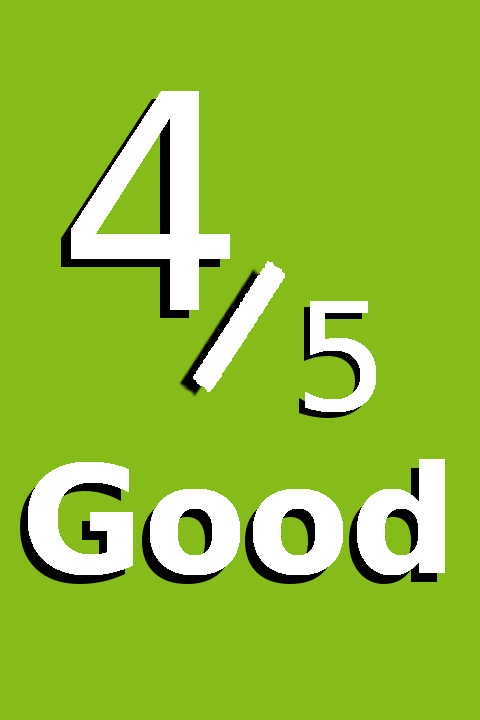 Objectivity forms no part of it, but fairness and receptivity are the watchwords I try to uphold. Usually I attempt to critically analyse, in the detail I feel appropriate, the elements that profoundly moved me, or conversely failed to. And of course, whether or not the game was ‘good’ in my opinion; the two are by no means the same. I felt this preamble necessary, because I tried no less than half a dozen times to write this review in my regular fashion, not once did I achieve more than a paragraph. Stellaris draws me in with its melange of sci-fi concepts, and hooks me with its technicalities, the depth of its mechanics and systems. It did not simply lure and hook me once; it has done so every day this last week. It is not that I enjoy playing it, rather I enjoy thinking about it; but once I start playing I cannot stop. I’m not being cute or hyperbolic, it takes considerable physical effort to look away, let alone rise or do anything. I’ve lost numerous six-to-eight hour stretches, would have missed meals entirely had others not been kind enough to verbally shake me from my obsession. It’s also important to understand that I’ve had hours in which nothing happened. Nothing at all. I did not colonise a planet, wage a war, genocide a race, nothing. But I couldn’t stop watching, or worrying. This is not the first such game to do exactly this to me, Star Wars: The Old Republic, for instance drew me in with the promise of a Bioware take on Star Wars, and kept me wasting away at the keyboard with its systems. Total War games do it too, but they are a different case, I think they are ‘good’ strategy games in the traditional sense. Again, I do not enjoy playing Stellaris in this way, I’ve heard people describe this as a ‘Zen’ state, but as a meditator (Theravada, not Zen) I know this to be untrue. It’s more like a nervous addiction, I’m wholly focussed alright, but not mindful. It’s obsessiveness, a very physical and stressful attentiveness. There is no peace or stillness, and for me no enjoyment, yet I do it nonetheless. When I speak of deep mechanics and systems, and their ability to ‘hook’ me, that straining obsessiveness is what I mean. I’m not really talking about Stellaris’ range of high-end strategies or advanced ways to play. There are many profound flaws with its mechanics when discussed in the more traditional sense; you can be boxed by borders, limited by all too rigid diplomatic rules for instance. As I mentioned, I’ve spent whole afternoons basically doing nothing, not expanding territorially and only glacially technologically advancing. That doesn’t make for a good time in the traditional sense, but it appeals to my analytical sensibilities in a way few games have ever managed; I concoct more plans and contingencies than I do warships. I’ve intentionally not discussed the constituent systems and mechanics in any depth – if that’s what you were looking for I’m sorry. 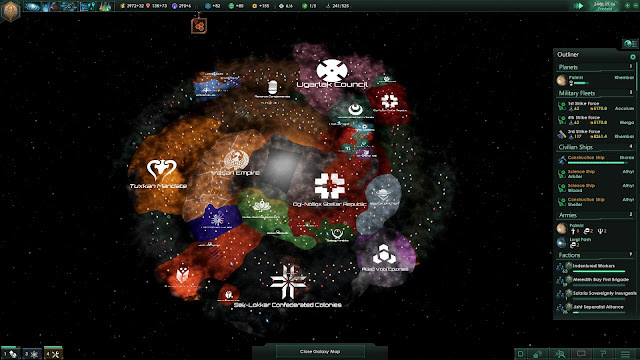 Stellaris is developed by Paradox, of Crusader Kings and Europa Universalis fame, grand strategy games pedalling a very similar complexity to that which I have described. It also adapts a number of distinctly 4X strategy elements, 4X being a breed of strategy game I’ve never taken too, the space defined by Civilization and Master of Orion. I think it splices the two exceedingly different forms of strategy game together effectively. The one mechanic I would like to highlight is research. In Stellaris scientists are the pillars of any society, be it despotic empire or religious movement, they chart the stars, uncover detritus of long deceased civilisations, and most of importantly of all, spearhead technological advancement. The research and technologies are spilt into three branches; physics, society, and engineering, each branch will need a chief scientist and each undertakes one research project at a time. The research is at least somewhat random; you don’t progress through an explicit technology tree, and that’s wonderful. At least three options are available at any time for any branch, many of the technologies are chained however; you can’t research advanced armours until you have the basic ones – unless of course you encounter the necessary technology, perhaps salvage it form an enemy wreckage, or uncover it in an abandoned alien metropolis or the like. The random serving helps differentiate play through meaningfully and organically, and in that regard is every bit as important as the race politics and traits, and the random events and mission chains. It also adds an air of realism and appropriate excitement; technologies trees break the illusion of evolution and advancement, how might one know the far reaching consequences of a speculative technology? 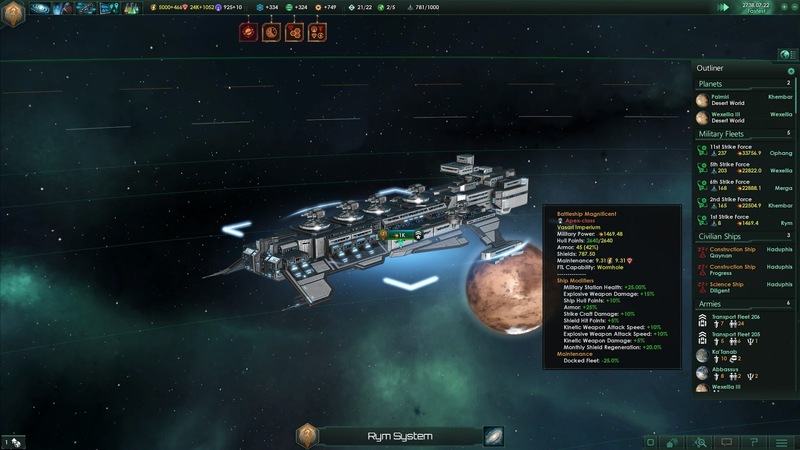 Stellaris allows you to research one technology, while its repercussions may take years to be realised, likewise a military technology may have unseen civil applications. The science fiction of Stellaris reaches far and wide, as it should given the potential size of galaxies and the number of discreet factions they can hold. Yet it feels cohesive, it is a fiction united in its reverence to the genre. I do not doubt that one could point to a half dozen authors and draw lines of inspiration, I frequently find myself in the Commonwealth of Peter F Hamilton – why yes I use wormholes, and I was terrified of what I might find within the Dyson Sphere. Technologies and events, be they longer mission chains or one-of anomalies, are the most frequented avenues of overt sci-fi storytelling, but fallen empires and crises are the most standout. I don’t want to go into too much detail concerning the crises, watching them unfold in one’s own galaxy is not an experience I’m prepared to tarnish. Fallen empires however are highly advanced races, aliens whose society bloomed to unparalleled technological heights, then stagnated. They come in a few forms; observers who have watched your race ascend to the stars, or sleeping tigers, once proud armadas who foolishly guard a society in social and technological limbo, a society wrapped in the safe arms of mighty ringworlds. Fallen empires and to a much greater extent crises, are more than mere challenges; they do not operate on the rules of other alien factions, which includes your own. Once you look past your gut reaction to an alien species, you quickly realise all are as human as you. 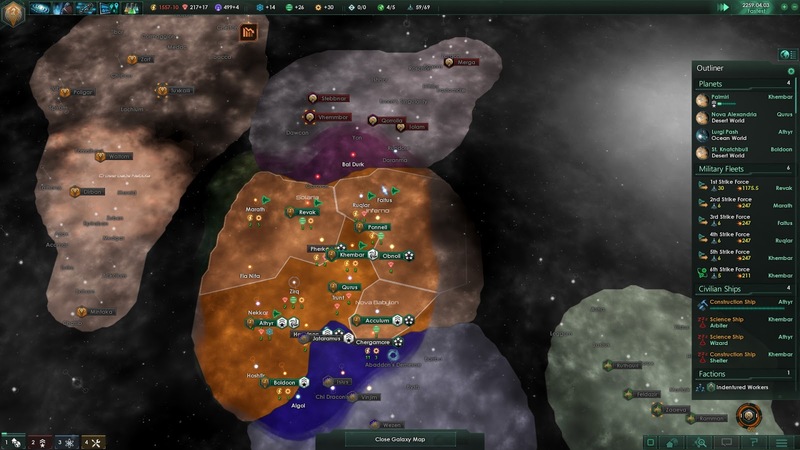 The technology system certainly helps, so too do the policies and the AI, but it becomes clear you could achieve all they have, you can comprehend their technology and even the way they think, thanks to the diplomacy mechanics. Fallen empires and crises introduce elements that defy the conventions you’ve grown comfortable with, and that’s a wonderful thing for a piece of science fiction and a strategy game. The sixty hours I’ve spent have been extremely varied, my three civilisations very different from one another. Now who is to say that by hour eighty I won’t have seen it all? It’s possible, but I’m frankly surprised the second twenty hours were different than the first. Stellaris delights in the same aspects of sci-fi epics as I do, and that is what draws me in each day, but it’s the stress-inducing systems that keep me playing. These systems possess very specific flaws in their design, and there are technical issues too. I don’t even think I enjoy engaging with them; I might compare managing a civilisation in Stellaris to normalising a database, before I would liken it to playing another kind of game. 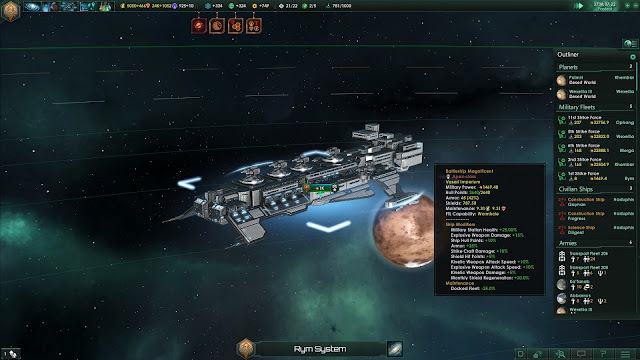 I like Stellaris very much; it has a more confident grasp of the science fiction than most other games I can recall – the original Mass Effect being one of the few I think equal it. I do not believe the gameplay to be incomprehensibly complex, but it does demand a very different kind of attention, an analytical ardency.